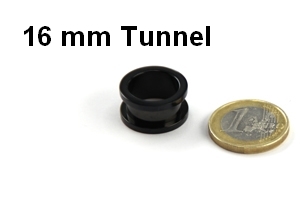 16 millimeters are a very good size if you like to wear eye-catching flesh tunnels like picture plugs or silhouette plugs. In 16mm you can choose between all materials available. But please think of one thing: steel and glass tunnels can get really heavy in this size. So probably think of silicone or plastic tunnels as an alternative because they are much more lightweight. Another lighter alternative would of course be the wood, bone or horn tunnels. Thes look pretty nice and individual because of their natural grain. If you think of stretching your earlobe piercing further please do it carefully and take your time. Although it is possible to continue stretching in 2mm steps now you should always give your histoid the time to gegenerate completely. Please don´t continue stretching before the healing process is completely finished.